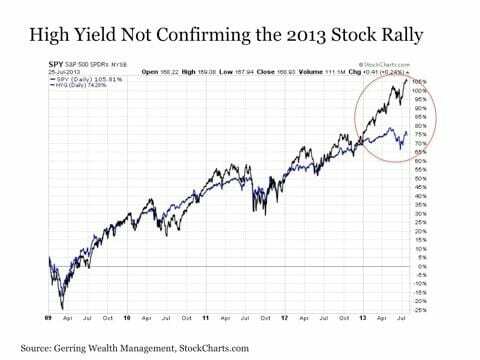 Investing Advice And InformationPersonal FinanceIs the Stock Market about to Roll Over? This is typical of naive analysts (Money magazine types) who constantly look for correlations, and therefore causation. Granted, the best time to be in stocks is when interest rates are low and the economy is in recovery (2009-2013). But now we are entering Phase 2, the “great rotation” out of bonds and into stocks, and it could last for several years. It is not necessarily bad to have rising interest rates. It doesn’t necessarily predict a crash in stocks. It could predict a return to a more normal economy. I admit that Wall Street could take a 20% haircut in October (just to pick a month) like it did in October 19, 1987 (I remember it well — it was my 40th birthday!) — but who knows? Austrian economists know better than to pick a date for a crash. We haven’t seen a serious correction in some time, and it may be due, especially with corporate earnings topping out and the market selling at a relatively high price-to-earnings (P/E) ratio that now is approaching 20. Austrian financial economists also know that the current bull market on Wall Street is both genuine and artificial: genuine due to the fact that major corporations have done a good job in cutting costs and becoming more productive and enjoying better balance sheets… artificial due to the Fed’s never-ending easy-money and low-interest rate policies. If the Fed suddenly ends its Quantitative Easing program, watch out below. However, all indications are the Fed is pouring on the juice in 2013 — the monetary base (the Fed’s checking accounting) has been growing 40% all year long… and the broader-based money supply (M2) is growing at an above average 6%. For now, I am 100% invested in stocks, mutual funds and closed-end income funds. You Blew It! Getting a Student Loan? Student loans largely have been a disaster. The federal government’s easy-money loans to college students have resulted in sharply higher tuition and have saddled middle-class income earners with excessive debt. Sadly, two-thirds of students receiving bachelor’s degrees have had to borrow money to fund their education, with an average student debt of $26,000. And today, only 38% are making payments on their loans. The smart thing to do is to avoid student loans like the plague. To avoid going into debt, consider (a) living at home and attending a local college or taking online courses, (b) taking full advantage of scholarships and grants from colleges, institutions, churches and communities, (c) living frugally and (d) working while you are going to school. I did all four when I was in college in the 1970s. I lived at home and attended a local college, applied for and received partial scholarships, lived frugally and, last but not least, held four or five part-time jobs while going to school. I worked as a janitor, a teacher’s assistant, an editor of the student newspaper and a research assistant, all of which put me through college. As a result, I graduated in 1972 with a master’s degree in economics, a new car fully paid for (an Opel), a full-time job with the Central Intelligence Agency (CIA), a fiancé — and no student debt!